Solar3D have successfully created the first prototype of their new 3D solar cell. 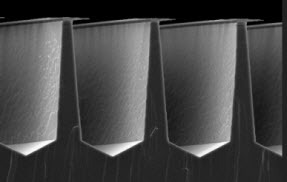 The results are promising – the new type of solar cells have 2.5 times greater efficiency than it`s conventional counterparts. What is it that Solar3D is doing to be able to boost the efficiency rates by this incredible amount? Scientists have for a long time learned to look at nature and how evolution has shaped plants and animals for better performance at what they do best. Solar trackers follow the trajectory of the sun, which is the basis of a new and better performing solar tracker. If we look at other organisms that are reliant on the photosynthesis for energy maybe there is more to learn about how to harness solar energy? Algae are responsible for producing the majority of the oxygen we breathe – a byproduct of the photosynthesis. These organisms are literally the foundation for most of life on earth. Through millions of years they have evolved to get more efficient at absorbing sunlight. If we were to take a look through a lens of an electron microscope directly onto the shells of algae, we would not see a flat surface, but instead tiny nanostructures where sunlight is “trapped”. Similar structures are also seen in land plants. As you can see in the picture, sunlight can enter the surface of the solar cells easily, but will have a harder time getting out of it. This allows more time where electricity can be generated. Although still early in the development, Solar3D aims to have a working model of solar panels based on their three-dimensional design already by the end of 2013.